In this optical illusion there is a wall of black text on a white background. When you first look at what it says it appears to be nothing but nonsensical gibberish, however this is not the case. 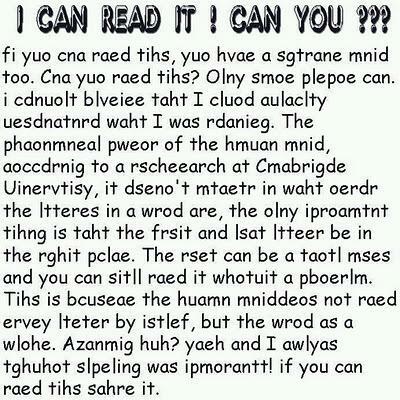 Look at the image again and start reading the text and you will see what I mean. Can you read what the message says? In this optical illusion we have an image of a yellow-orange square box with five rows of turquoise and white arrows in the middle of it. As you can see the arrows form a circle and vary in size starting with bigger ones on the outside and ending up with smaller ones at the center. 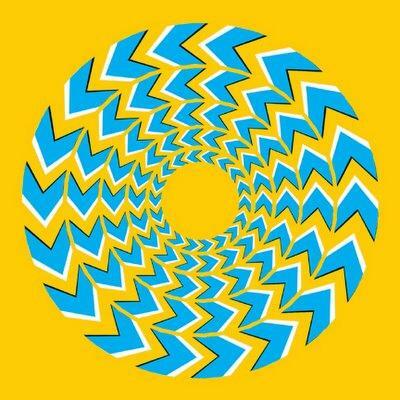 If you move your eyes over this image it will give the illusion that the arrows are revolving. This is one of those optical illusions where you will probably find you have to do a double take before you notice any difference in what you are first looking at. So to start with, what do you see? 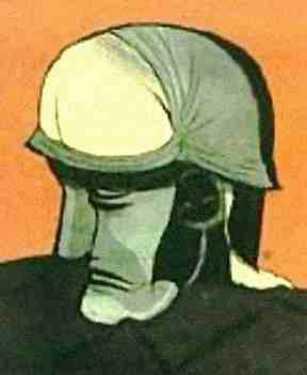 On first glance this image appears to be the face of a roman soldier wearing a helmet and facing left, but if you look again you can also see it is an image of a man bending over while facing the wall and showing his behind. What better optical illusion for Valentines Day than an image of a beating heart. As you can see this is a picture of a heart shaped image made up from what could be a gold necklace on a red square background. Very romantic! 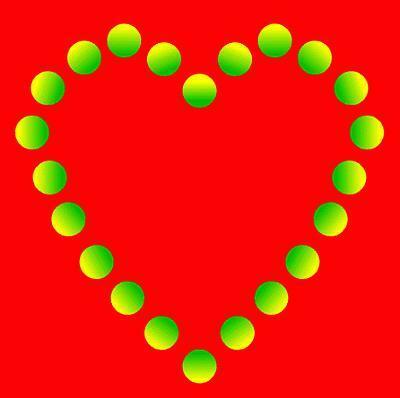 If you stare at this image it gives the illusion that the heart is beating. For best results blink while looking at it. Happy Valentines Day! I think most people have heard the saying about cows being curious and the black and white cow staring back at you in this image is no exception. I am curious myself about what this cow is interested in when the other cows in the herd are busy grazing in the background. Perhaps the photographer is showing it a handful of hay in order to grab its attention. Who knows, but it looks like it has had the desired effect. 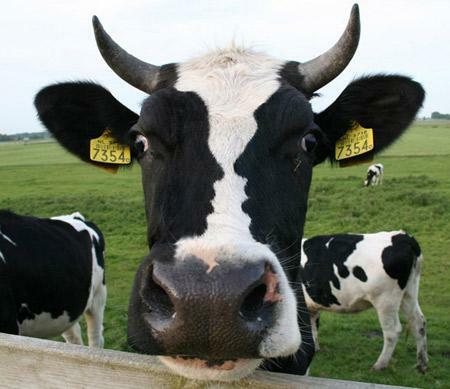 So going back to the cow's face, if you look carefully at it, not only do you see the cow's face but it also gives the illusion that there are two black silhouettes of human faces looking towards each other.